La Casa del Gigante is an upscale luxury villa in the most exclusive location of Monterosso. This prestigious villa in Monterosso is part of the construction near the famous giant statue, Il Gigante. The Giant is the symbol of Monterosso village. From this statue the house derives its name. The building is an art creation of the famous Italian architect Claudio Andreani. While Piero Pinto, one of Italy’s most famous and sought after interior designers, created the interiors. Its history is curious and charming. Its architecture is brilliant and welcoming! It is a unique privilege renting this villa in Monterosso, Cinque Terre! La Casa del Gigante luxury villa has private access from the narrow road that leads from Fegina beaches to the the most impressive villas of the village. It lies right below the Monterosso towers, one of them available for rental La Torre dei Merli. The place has a distinctive trait: huge arched windows that lighten the dining and sitting area of the villa. The property concept is that of a huge cave protected by these giant window panes. The glass let the sea and the sky enter and lighten the indoor spaces. The construction is well recognisable from Vernazza, resembling the base on which the Giant statue rests. Leaving the sitting-dining area a lovely staircase leads us from the lower floor to the upstairs double bedroom. It is a spacious loft with a double bed. Lying on bed guests can rest and admire the waves, Vernazza and the other Cinque Terre villages in the distance. The private bathroom of this bedroom is amazing as the rest of the villa: a long vertical glass offers the view of the sea while showering! Back to the lower floor, we have another bathroom with shower. From the sitting/dining area we have access to to curved space where we have a sofa turning into two single beds (that can be joined on request). Air conditioning in the lower level, Fan in the bedroom loft. There’s no space for a washing machine but in case you need doing your laundry you will receive, on arrival, a coupon for doing your laundry at a serviced laundrette nearby. The views from La Casa del Gigante are breathtaking. This is really a singular villa in Monterosso: the changing colors of the waters below, the brilliant lights on Vernazza in front of us and the shades and hues on the Cinque Terre coastline make this place a unique observatory point. The villa has a strategical location near the beaches, with easy access from the train station (a short walk 250 mt, all flat). The property offers the possibility of benefiting a VIP access to the prestigious Circolo Velico of Monterosso (local yacht club) at preferred rate. Reservation is mandatory both for marine activities, lunches and dinners. La Casa del Gigante luxury villa is ideal property for couples but also for families of 4 people. 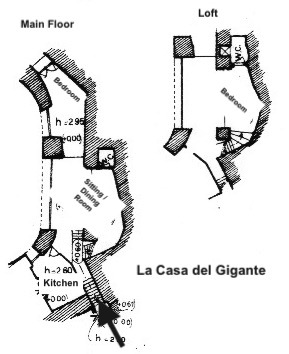 La Casa del Gigante has an intriguing and lovely history. Lots of info on the area are to be found at the link of Monterosso Circolo Velico. The “Circolo” is the yacht club right below, which was born by the will and with the funds of the De Andreis family. Mr. Gino De Andreis, is a cousin of the poet and Nobel Prize Laureate Eugenio Montale. This famous poet’s holiday house, Villa Montale, lies a few metres afar from La Casa Del Gigante. The statue of the Giant, Neptune, is art creation of the Italian sculptor Arrigo Minerbi (the favorite artist of Gabriele D’Annunzio) and the architect Francesco Levacher. In the past the impressive sculpture, with their 14 meters high, stood on the promontory as decoration of the luxurious Villa Pastine (built in the early ‘900). In addition to the trident Neptune was holding a gigantic shell on his head, that was nothing more than the beautiful house terrace. Unfortunately, during World War II, Monterosso was under the bombs of the allied forces and the Neptune statue (along with the villa) and most of the villa collapsed. Its destruction was even greater after heavy seas in 1966. 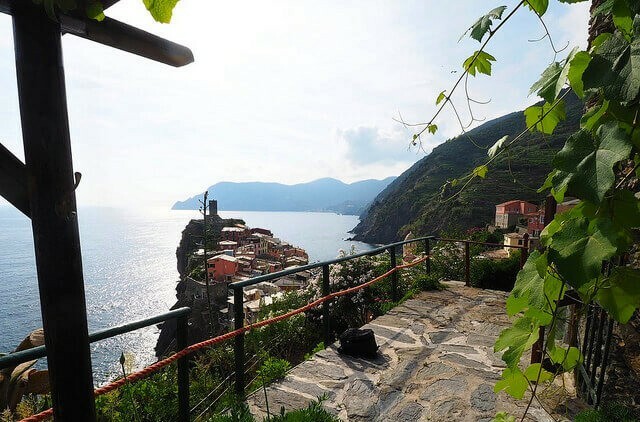 The owner of La Casa del Gigante would be pleased, when he is in Monterosso, to personally welcome his guests, talk about the villa history and offer you a glass of his own wine. 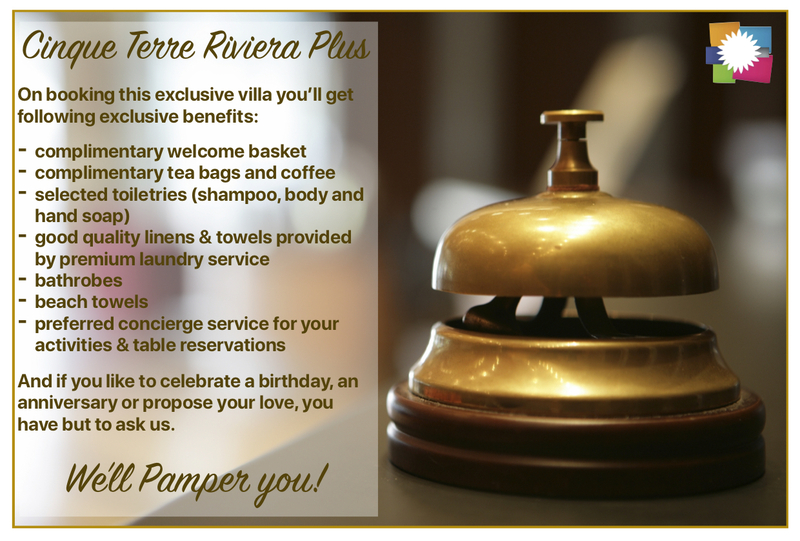 Before your arrival you can verify with Cinque Terre Riviera if the owner will be around! Claudio Andreani (Carrara, 16 maggio 1914 – Genova, 11 giugno 2005): is an Italian architect, disciple of famous Marcello Piacentini, who is famous for being the architect of the monumental buildings of the Italian Fascist Era. He worked a lot in Rome and then in Liguria, where he created curious buildings on the waters such as La Casa del Gigante in Monterosso and Domus Mare in Bogliasco (Genoa). More.